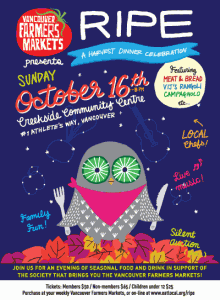 On October 16th, 2011, the Vancouver Farmers Markets will present their 3rd annual dinner fundraiser event: RIPE: A Harvest Celebration, at the Creekside Community Centre from 4pm – 8pm. RIPE is a casual, family-style meal that includes a feast of delicious and seasonal food prepared by local chefs and market vendors, regional beer, wine, and cocktails, a silent auction, and live entertainment. The RIPE dinner will be a sit-down, buffet-style meal starting with appetizers prepared by chefs from Meat & Bread, Vij’s Rangoli, Campagnola, and Swallow Tail Supper Club, using seasonal food provided by Farmers Markets vendors. Cocktails, beer and wine will be sipped while enjoying the spectacular view of the mountains from the Creekside Community Centre in Olympic Village. 1. To grow and improve the organization that hosts Vancouver’s weekly, year-round Farmers Markets in their efforts to bring healthy, local food to urban consumers. 2. To build the Farmers Nest Egg Fund, an initiative created by VFM to help farmer vendors in times of financial need and to expand the network of local farmers that make the markets so successful. RIPE tickets are available at any of the Vancouver Farmers Markets, at Rangoli Restaurant, and online at http://eatlocal.org/ripe/. Ticket prices are $50 for members, $65 for non-members (includes one year VFM membership), and $25 for children under 12.